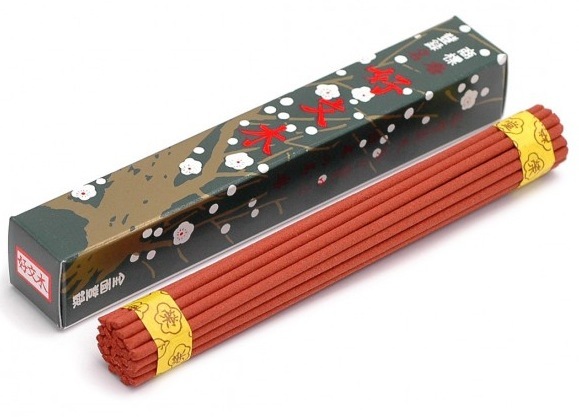 A classic Japanese Incense from Baieido - a spicy and sweet fragrance. Original Kobunboku is an expression of the Plum Tree. The flower is well known as "The flower of peace" from ancient China. Baieido are one of the top three Incense companies in Japan and this is a premium product and best-selling product of theirs. Original Kobunboku is also available in 100 Stick, 220 Stick and 85 Long Stick versions. Please see the Baieido Incense section of the shop for more details. Karen @ Vectis Karma says "This small pack item in Baieido's Original Kobunboku range is great value and a wonderful introduction to Baieido's spicy/woody/sweet/herbal lines of fine Japanese Incense. A great item to start with if you're not already familiar with Baieido's excellent Japanese Incense Sticks." Light the tip of the stick with a match or lighter, then gently blow or fan out the flame, leaving a red ember burning at the tip of the stick. Then insert the stick into the holder. This could be a hole designed for the purpose, or a more open sand area, which holds the stick well and allows flexibility for sticks of different diameters. Incense sticks are safer than candles – no open flame – but please be sensible; do not burn unattended. Don’t place in a drafty position (will burn down too quickly and dissipate aroma). Make sure Incense is fully extinguished before leaving room. Keep out of reach of children and animals. Very delicate sticks.Low smoke burn. Very nice subtle scent. One of my old favourites, always have a few sticks of this incense. Lovely. This has a lovely fragrance, rich and woody. Perfect for meditation. I'll be ordering a big box once these have run out. Great products, and arrived very fast! Thank you! Nice smell however these have no thin end to put into my stick holder. Not very practical.They are also very brittle. Handle with care. Not a pleasant fragrance. Disappointed but pleased to have tried. The Nippon Kodo Quality Collection is far better.